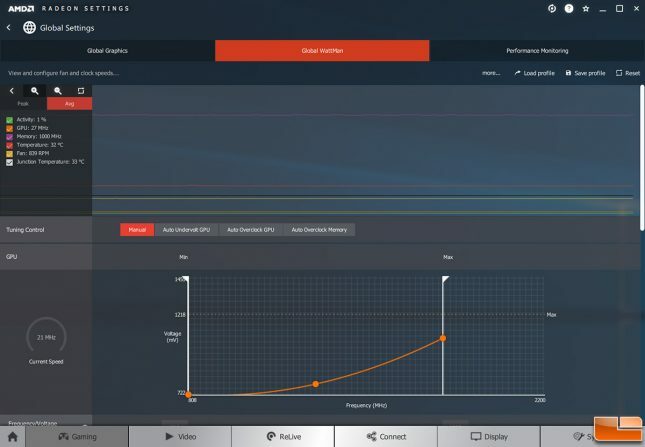 Overclocking the AMD Radeon VII was not mentioned once in the 22 page reviewers guide or the 28 page press briefing deck despite AMD putting more overclocking features than ever in Global Wattman. 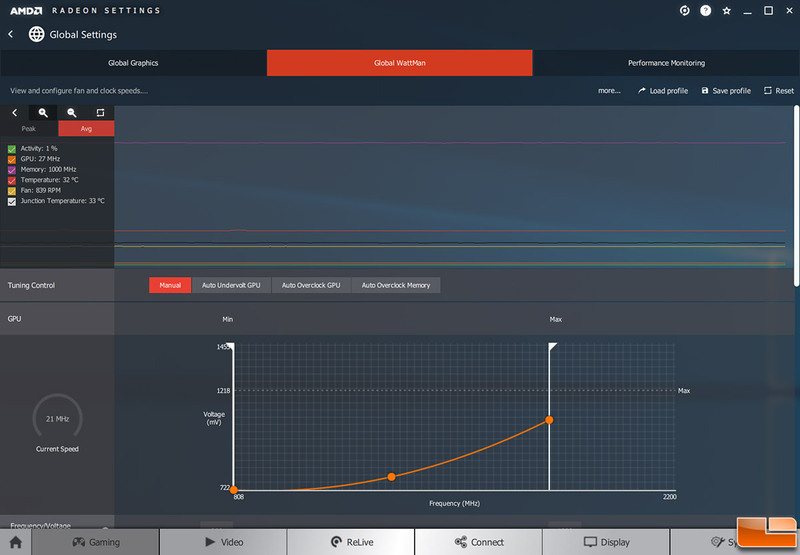 AMD has now put in ‘Tuning Control’ in Global Wattman that gives you the choice of auto underclock GPU, auto overclock GPU and auto overclock memory. You can only do one of these tasks though and will need to use manual settings to still get the most from Radeon VII. We overclocked the Radeon VII manually and was able to get another 53MHz from the core clock and was able to bump the 16GB of Samsung HMB2 memory to 1200MHz from 1000MHz. The only problem is that the benchmark results showed a performance decrease with the overclock. We talked to AMD about our results and they suggested undervolting the GPU and raising the power target to +20% to keep the card from being power constrained. AMD recommended dropping the GPU power down to 900mV from the default setting of 1069mV. We tried that and the power on the card dropped dramatically, but the scores were still low. We then overvolted the card to 1100mV and even that couldn’t get over the stock score, so we gave up on overclocking Radeon VII at this point. This is the first video card in our 17 years that we have been online that we weren’t able to see any performance improvement with overclocking. So, with roughly a 50MHz increase on the GPU and 200MHz increase on the HMB2 memory we noticed no performance improvement on 3D applications. What we did learn is that dropping the GPU voltage dramatically lowers the power on this card. Dropping the power from 1069mV at stock settings down to 934mV took the power from 342 Watts down to just 274 Watts. That is a 68 Watt reduction or about 20% lower power consumption. It of course also lowered temperatures and noise levels! It feels like AMD was overly generous on GPU voltages, so you’ll be able to play the silicon lottery game with Radeon VII cards and see if you got a good card for undervolting. So, overclocking was a no go on our test sample, but undervolting was amazing and worth looking into. Let’s wrap this review up!